The following clips from the Swan Archives' exclusive collection of Phantom of the Paradise outtakes and deleted footage have been reedited, and had sound added, by filmmaker Garrett Gilchrist. Garrett's editing presents some of the outtakes, raw footage and deleted scenes from the film in context, with the appropriate audio from the film and the soundtrack album. This allows you to enjoy the uncut raw footage of The Juicy Fruits performing "Goodbye Eddie " and Phoenix performing "Special to Me " with soundtrack included, and to endure the gory deleted Winslow record pressing scene as if it were included in the movie. Where no audio was available, Garrett added sound effects (such as the guard's gunshot shooting Winslow and the sound of clapperboards). In addition, we've included Garrett's music videos for "The Hell Of It" (which mixes footage of two televised Paul Williams performances of the song), and a version of "Faust" in which he combines video footage of the Phantom with audio of Paul Williams' performance of the song. Garrett is a filmmaker, screenwriter and editor who has directed the low-budget feature films Shamelessly and Gods of Los Angeles. He created an acclaimed restoration of The Thief and the Cobbler, a never-completed animated masterpiece by Richard Williams (Who Framed Roger Rabbit). He also created the popular documentary Star Wars: Deleted Magic, an unofficial behind-the-scenes look at the editing of Star Wars, and as an animator created the WhoSprites project, animating lost episodes of Doctor Who. He works as a writer for The Editors Guild Magazine. If you're interested in exploring Garrett's other work, we'd encourage you to check out his site, here. Complete deleted scene of Winslow Leach getting his face crushed, and being shot by a guard. Sound for the missing section was created from scratch with various effects added. Raw footage of "Special to Me," from takes 1 and 4. Apart from two brief shots in the credits, none of this was used in the film. Two takes of raw closeup footage as the Juicy Fruits sing "Goodbye Eddie." Several shots from the end credits were used here as well. "Goodbye Eddie" with two shots restored -- the original "Phantom" title, and a shot of the Swan Song marquee and billboard that Winslow pastes his own name over. The end of this video shows how this footage might have been used in the movie if included originally. The entrance of William Finley into the shot times perfectly to the cut, but you don't see the "Swan Song" marquee and the big crane move down to street level. So in the middle of the video, in its proper place, the missing part of the shot has been sped up to twice its original speed...oddly, it fit perfectly, to the exact frame. Paul Williams sings "Faust" as William Finley mimes. In the film, you hear the Phantom's croaking, electronic voice over most of this; this version uses Paul Williams' voice throughout...Garrett filled the time with a montage of footage from elsewhere in the film. 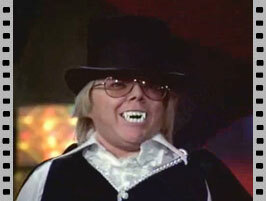 A mashup of two televised Paul Williams performances of "The Hell of It": on the last episode of The Brady Bunch Variety Hour, and on the second season premiere of The Hardy Boys/Nancy Drew Mysteries (in which they "Meet Dracula"), a few years later.